I met Noel at a huge Trevor Carpenter-planned photowalk in Santa Monica last August (2007). I haven’t hung out with him since. It’s crazy because he doesn’t live that far away from me! Wait, he has a wife, Jack, his job, and photography to keep him busy. Saturday morning, I get an email from Noel. He’s going to Downtown LA to buy a used Canon EF 17-40 f/4L from some guy and wants to know if I’d like to photowalk for a few hours after the transaction. I tell him to meet me at Pershing Square, wake myself up, and head out the door. 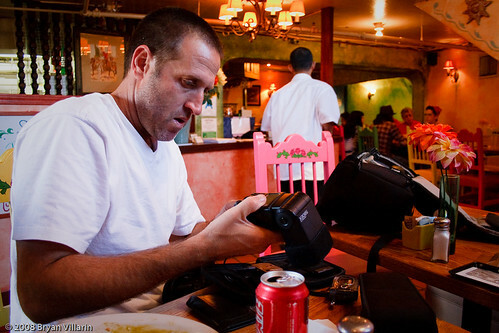 Noel recently upgraded to a Canon EOS 5D from a Canon EOS 30D, which he’s keeping as a backup. He now has a plethora of high-quality SLR camera bodies, lenses, external flash units, and a steady stream of clients[1. At least compared to me – and he’s only doing this part-time.]. We probably photowalked about three miles. Noel shared his stories regarding portrait, architecture and event photography[2. And whatever else he doesn’t share on Flickr. ], providing inspiration and encouragement that I could do the same. I can’t entirely rewrite what Noel tried to teach me that afternoon. All I can say is that he’s sincere, fearless, and generous. Noel’s children portraits are one of my photographic inspirations. I’m so stoked I have a friend like him to ask for advice. Although I can’t see myself going full-time, I will be attempting to pursue this further than a casual hobbyist. With my successes and failures, I’ll do my best to share what I’ve learned because like Noel and many other photographer friends that have helped me, I’m going to pay it forward. You can find Noel Kleinman at nkpix.com and Flickr. Also, the photos I took at Saturday’s Downtown Los Angeles photowalk are in this Flickr photoset. Previous Previous post: If you were a hot dog, would you eat yourself?